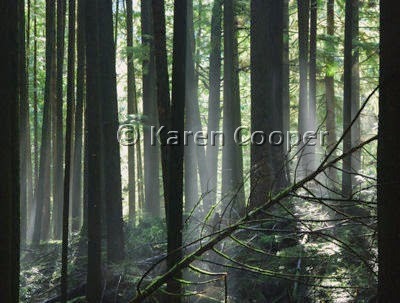 Buntzen Lake Park is located 30 kms from Vancouver and offers several different hiking trails for all fitness levels. The short drive to this area is a treat in itself, following along Burrard Inlet with some beautiful views of the ocean. The road is twisty so keep a eye out for traffic, when you can pull yourself away from the views long enough. That's the problem with cars, takes all the fun out of sightseeing when you are the driver. Well, we cope. Even on cool, rainy days this area is pretty spectacular. Mist on the water and along the trails is ephemeral and spooky, and offers some great photo ops. Okay, lets face it, when you have a camera in your hands, almost anything is a great photo op. I have been known to crawl belly down along gravelly paths to get just the right angle on a skunk cabbage flower. Or end up thigh deep in swampy marshland to get that lily pad in just the right light. The whole process of finding what's out there in the world is a blessing. Sharing it with others is my definition of nirvana. But then, I happen to like swamps. And skunk cabbages. love this image...think I prefer it in colour actually. yes. Wow what a wonderful photo, GREAT JOB!.